1. Bahn, Paul G. (2000). The Atlas of World Geology. New York: Checkmark Books. p. 128. ISBN 0-8160-4051-6. 2. "Golden Mountains of Altai". UNESCO. Retrieved 2007-07-31. 3. 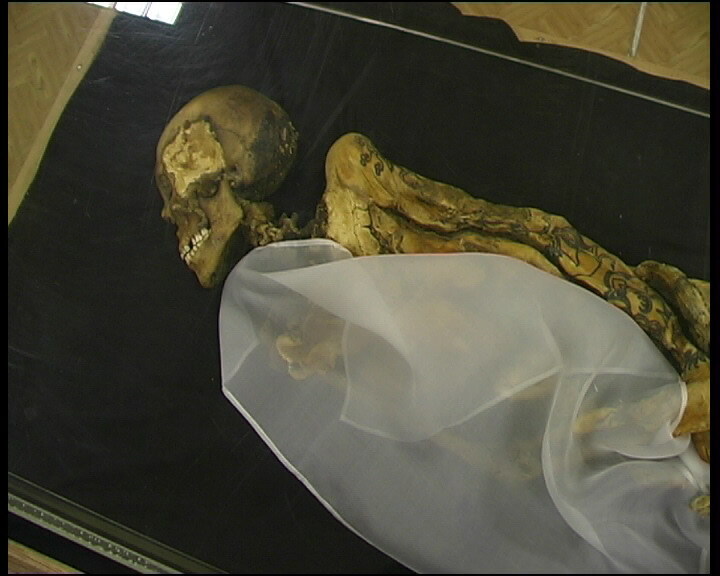 "Ice Mummies: Siberian Ice Maiden". PBS - NOVA. Retrieved 2007-07-31. 4. "Prehistoric Art - Early Nomads of the Altaic Region". The Hermitage Museum. Retrieved 2007-07-31. 5. "Bronze collect at Novosibirsk State University - including Pazyryk". Retrieved 2006-11-30. In 1990-1995, South Altai troop of the North Asia complex expedition of Siberian Branch of the Russian Academy of Sciences conducted research at the Alpine plateau Ukok, situated near the Chinese, Mongolian and Kazakh borders. In the course of excavations of one of the mounds of Ak-Alakh sepulchre, a unique burial of a woman was discovered. Her remains were found lying in a wooden framework (3,3m - 2,3 m) made of larch and rough-hewed smoothly from inside. The framework was set at the bottom of the sepulchral pit. The whole space of the sepulchral cell - right from the ceiling made of eleven closely fitted logs down to the very bottom - was filled with ice. A linen - several strips of black felt sewed together - was spread instead of a floor right over the previously laid out pebbles. There was a massive trough in the southern corner of the sepulchre. Its lid was hammered in by copper nails with round heads. Leather ornaments presented as figures of deer were found in the trough as the ice inside of it melted. There were dishes with food near the trough. Two flat-bottomed ceramic jugs, destroyed by ice, lied on the floor. Pieces of meat remained lying on the dishes. There was even an iron knife stuck into a piece of meat, the handle of the knife representing symmetrically arranged effigies of the upper part of a wolf''s snout with Capricorn''s horns. Thus, wolf''s sharp-toothed jaws appeared to be the center of the composition adorning the handle. Six horses were laid in the northern part of the sepulchral pit just like in all other Pazyryk burials. Horses'' hair, plaited tails, wooden harness ornaments, components and felt covers of saddles were preserved. The woman was lying on her right side in a sleeping pose with her legs bent slightly in her knees and hands crossed on her belly; she was lying over double-folded thick strip of felt, her head on a felt pillow-bolster. She was covered with a fur counterpane with appliques representing vegetable ornament, made of golden foil. Her clothes were well preserved. All seams of her ample silk yellowish shirt with long sleeves covering her fingers were trimmed with thin red cord, while its hem, neck, the edges of the sleeves and the center of the shirt were decorated with a red ribbon; her lengthy two-colored (red and white) woolen skirt had a thick red belt wound of woolen thread; on her legs she had long white felt stockings decorated with patterns of felt appliques in the upper part. The dead woman had her personal things in the sepulchre. A mirror in the form of a square piece of bronze plate framed by a round wooden setting with a handle and with a deer effigy cut on its back side, laid over the skirt near the woman''s left hip. The polished surface of the bronze plate was rubbed with mercury, which not only made the surface shine, but also imparted the plate with the properties of a real mirror. The amulets - beads, bronze pendants - were threaded and tied together. There was also a "vanity case" - horse hair brush; some spread out blue and green powder-like substance - vivianite - a mineral used in manufacturing of blue paint; components of a peculiar pencil - a rod made of iron rings where vivianite served as a slate. Such pencil could be used for ritual face painting. There was also a stone saucer with coriander seeds. It is obvious, that this is a sepulcher of an outstanding woman. The spacious sepulchral cell, body embalming and the body''s laying over a decorated trough, the six horses with extremely beautiful and recherche harness - all these speak for the fact that this was a wealthy woman of a special society position. The woman''s shirt may be considered the real evidence of her wealth and high social status - a real value for the Pazyryks: it could be come across only in "tsar" mounds. It is noteworthy, that it was the first time when Pazyryk clothing made of silk was discovered. According to ethnographic sources, the difference in clothing between the rich and the poor among Pazyryk cattle-breeders was very often reflected in the materials used. The Ukok young woman had tattoos on her arms - from shoulders down to her wrists. There are also tattoos on some phalanxes of her hands. The blue-color "pictures" can be quite distinctly seen on her white skin, but they preserved only on her left hand, while there are only fragments of tattoos on her right wrist and thumb. Her right shoulder bears an effigy of a fantastic animal - a deer with gryphon''s beak, and horns of a deer and a Capricorn. The horns are decorated with gryphons'' heads, the latter can also be seen at the back of the animal, whose body is depicted "twisted". Below there is an effigy of a ram in the same pose with his head thrown back; closed jaws of a spotted ounce with long and twisted tail are depicted at the ram''s hoofs. There are some signs indicating that the dead woman, buried by her fellow-tribesmen with such profound respect, was remarkable for a certain gift that she possessed.